If you haven’t seen Google’s new “Dear Sophie” video, I highly recommend you check it out. It’s brilliant. 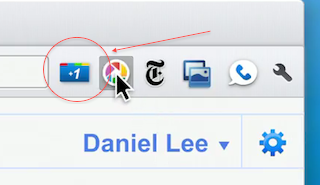 At various points in the video, the Chrome browser in use reveals an unreleased product: a Google +1 extension. For the best view of it, skip to the 0:51 mark. There it is, front and center, next to the Picasa button being clicked on. The funniest part of this is that Google is actually airing this video on national television as part of their new Chrome marketing push. So Google just leaked their own new feature to millions of people. Well, those watching very closely, at least. So what does the extension do? Hard to say since they never actually click on it in the video. But one can assume that it’s a simple way to +1 any site you’re visiting. Google formally unveiled +1 about a month ago as a way to socially share Google Search results with friends — and to help Google rank those results with social juice. I’m also wondering if the extension doesn’t have more social functionality — such as a way to share a link on Twitter and other networks alongside +1’ing it. You may recall that as they were developing +1, we kept getting leaks about it. One of those was a +1 toolbar that was apparently a way to share with other social networks. Google has also said that a +1 button is coming for publisher websites. But we haven’t heard any more on that since the original announcement. Anyway, a +1 Chrome extension is clearly on the way. And Google let us know about it either by way of a brilliant subliminal marketing move, or a big mistake in front of the entire American public. Either way, great ad. +1, really.